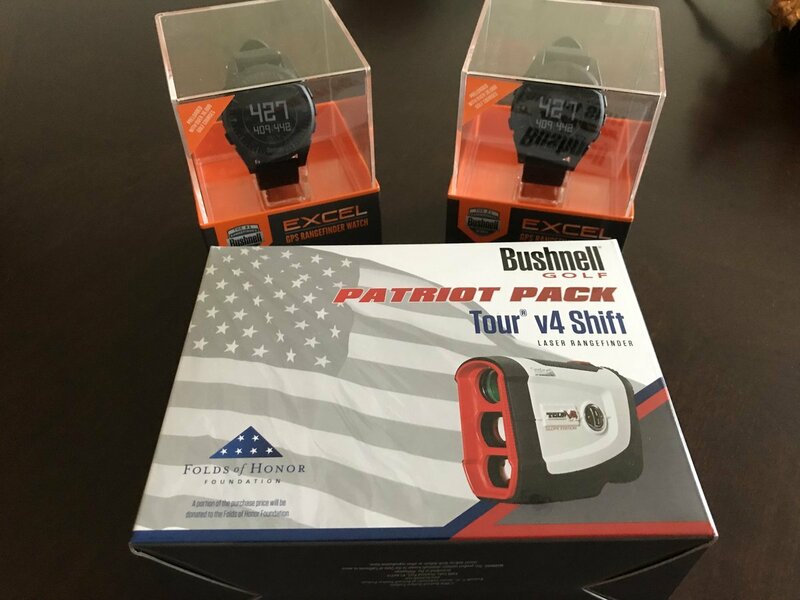 Happy Father’s Day from all of us at The Hackers Paradise and to ring in this holiday, we have partnered up with Bushnell Golf to give away some items. Let’s face it, Dad’s are playing golf and here at THP we want them to play better. What better way than knowing your distances with some of the best devices available. This contest features some great prizes from Bushnell Golf that will make any Dad out there happy. The Bushnell Excel GPS Watch features over 36,000 courses that come preloaded, a pedometer, so nobody can accuse us golfers of not getting in our exercise and a whole lot more. Its the best GPS watch I have personally tested to date and we have not one, but two of them to give away to lucky fathers out there. Next up is the Bushnell Tour V4 Shift Laser Rangefinder. Not only does this incredible device feature Pinseeker Jolt that tells you immediately that you are locked in on the target you are shooting for, it also has the Slope Switch to easily make this device conforming for USGA play when necessary. This brand new device comes with everything you need to jump right into action with one of the best distance measuring devices on the market complete with carrying case and Red Skinz Case. Entering is as easy as telling us in the comments section below, which Dad you want to give one of these prizes and why. Then sit back a few days and THP will announce the lucky winners in the THP Forum and you will have your device in hand in no time. My dad is constantly asking for yardages so this would be the perfect gift to give him, even if I’d have to show him how to use it. I would like to give this to a good buddy of mine named Scott who loves playing golf as much as i do. He’s an awesome father and great golfing buddy! I’d like to give the laser rangefinder to my golfing buddy (he has a golf GPS watch). He has kids and grand kids on both coasts and is always talking about them and finding ways to go visit them several times each year. When he does, he typically goes for a week at a time and, unlike what I would do, never plays golf! Instead, he devotes all of his time to just being with and interacting with them. I think he is a great and deserving dad and granddad! Would love to give this to a buddy of mine going through some family trouble. The one thing he has as a release is our weekly 9 holes. would love to give these to my buddy Scotty. he is a great Dad and would never be able to buy this. I would give it to my Dad, he’s always looking for sprinkler heads to get yardages to the center, and this will help his club selection. I would give it to my dad. He has always put me and my siblings before him. He recently used his reward points to get me a GBB Epic instead of getting one for himself. Would love to give this to a buddy of mine Jeff who doesn’t have any sort of yardage device. He’s a great player and just estimates yardages. He wants to start playing more competitive golf and could really use a range finder. I would give this to my buddy Will, he and his wife are expecting their first child this fall. I’d love to surprise my father in law with the Patriot pack, a good rangefinder would do him some good for sure! I’d give the GPS watch to my dad. I talked to him today and he hasn’t been out yet this year. We’re playing in two weeks and I want him to have an easy start to the year as possible. I would give to my friend, Terry! Although he’s never been an actual father he’s been an awesome stepfather and now will be a great grandfather to a little girl and little boy born one month apart !! Even if I don’t win this contest I’ll be buying him the coldest IPA I can find !!! Father’s gone, but I’d like to give this to my father in law who has treated me like his own son and taught me so much. I’m sure he would enjoy this awesome gift to replace his phone app that he uses. Thank you THP and Bushnell !!! I’d like to give this to my buddy Joe. His kid lives to far a way to golf with on a regular basis, but that doesn’t stop him from teeing it up every Sunday morning with me. If he had his own laser he could stop asking me for yardage numbers lol. I would like to give this gift to my younger brother and father of two! He’s passionate about golf and his kids… what better way to say Happy Fathers’s Day than a great range finder! On this day I want to repay that with my gift that he stops having to pace off distances from sprinklers. Good grief he will save 20 minutes a round. I would love to give one of these awesome prizes to my dad because he is one of the most generous people I know and it would be a great token of appreciation for all he’s done for me my whole life. Thank you for the opportunity, THP! I’d give it to my uncle who taught me how to play the greatest game – golf and go the distance in life. I’d like to give one of these to my husband who is crazy about golf and a wonderful father to our daughter. A rangefinder couldn’t begin to repay the gracious efforts of my father. He is, and always has been, my best friend. Some will remember that my mother suddenly passed away at a young age – certainly tough, indeed. However, in a time of sadness and struggle my father remained the rock of our family. My greatest memories are with my father. My greatest memory will always be my father. This would be a mere fraction of what my father is owed. However, he certainly would be thrilled. Just need a watch. Just need front and back yardage. Somehow the putt always drops. From anywhere on the flat. Would love to give one of these to my gramps. He turned 76 on Saturday, the day before father’s day. Now thst he is older and on dialysis 3 days a week he can’t hit the ball like he used to but by golly, he got out there and hit them like he did 10 years ago. He just doesn’t know what club to pick bc he can’t figure out his distances anymore. Would love to surprise the man that taught me how to gold 24 years ago. Some of the best times of my life are on the gold course with this man, and having him help me teach my 4 year old daughter just like he taught me is priceless, not to mention the course all 3 of us played Saturday was a course him and I played while I was growing up and to take my daughter to the place where we have the greatest memories was priceless. I will post a pic of him and my daughter in the thread for this! Thanks for the opportunity THP and Bushnell! I would like to give one to my buddy Erich. A great father and someone that works harder then anyone I know. My dad had back sugery last year and is retirinhg at the end of the month. The doctor gave him the ok to start golfing again, the rangefinder would be perfect for him. I would give my husband the Bushnell Tour V4 Shift Laser Rangefinder to replace his old rangefinder. He is passionate about golf but puts his love for golf second to his love for me and our 3 kids. I know he would love to get to the driving range more often or play more rounds of golf but he cherishes the free time he has with us. He often takes our 5 year old daughter with him when he gets the chance to go to the range and cheers her on as she bumps golf balls down the range with her junior set of clubs. Even our 2 year old boy has his own putter and has inherited the love for the game from his dad. The three of them often have putting contests in our living room before bed. We are lucky to have him and he tells me all the time that one day he’s looking forward to seeing if our kids take up golf and teaching them the proper way to play the game with respect and integrity. If I win I’ll be giving this to afwcardinal, he is a fantastic dad to 2 kids and has made great sacrifices for them to remain in Texas at same school while he works in Florida. And he was asking me for yardages all day saturday so this would be awesome for him! I would give my dad any of these great prizes. This has been a tough year for him healthwise, and I am just getting him back into golf activities in recent months. I would give it to my best friend’s dad. He is the one who has helped me out the last few months with golf and he invites me to play with his lower handicap friends and gives me advice on the course as well as encourage me to practice. He has never had a rangefinder and I know he would love it. Played with my dad and brother over the weekend for Father’s day. Different course with hardly any yardage markers and that’s all he could talk about, well I might could’ve gotten closer to the hole if I knew the actual yardage haha. That already vaulted this to a definite possibility for a Christmas present but I know he’d sure appreciate having one this season! I would offer it to my friend whose a great Dad but horrible at distances. I mean he’s just awful at yardages and this could be a great help to him. I would love to give either one of these to my dad. I bought him a GPS range finder a couple years ago and it recently stopped working so one of these would be perfect to replace that with. His game is starting to slip a little bit so this may help give him some more confidence that he needs. Would love to win one of these Bushnell products for my friend Frank. He’s a caring father who loves golf and is very deserving of winning some cool gear. I would love to be able to give this prize to my brother in law, a great family man and husband/father. He is also the one who introduced me to the THP! I would love to give this to my father in law. Nothing like some added confidence knowing the exact distance to the pin. Would love to give this to my dad. He doesn’t use any devices on the course and this would be a great gift to the guy who started me in golf many, many years ago. He’s raised and coached 2 kids in sports and is the person I look to for advice on parenting. He would be so surprised to get something like this because he would never spend the money to buy one for himself. I would give this to my golf pal. He is a bit older than me, probably enough to be my father and is a great father and grandfather to his kids. He certainly deserves it. I will give this to my dad! He taught me how to play when I was young, and I love the game because of that! I would give the other watch, and rangefinder to my father John. My dad lost vision in one eye several years ago and shoots blindly off yardage distances for his clubs. He is constantly asking for yardage, and his precision with a lack of depth perception is amazing. This would come in handy for the old veteran and would be greatly appreciated. Thanks for the contest, and good luck to all. I’d give this to my uncle. He’s a dad and he treats me like a son. Plus, he could really use something to help him measure distances. I would gift this to my dad. Golf is a game we share and love and this would be an awesome gift to give him. Would love to give this to my dad! He has had a rough couple of years as of late but he has always loved golf.. this would be a perfect gift for him! My father in law has been the father figure I didn’t have growing up. We didn’t really get along at first, but being forced to sit in a golf cart with him for hours has helped facilitate our current bond. He deserves the Bushnell product, and more. For my dad. Says he’s not good enough to use one, but still asks me for yardages a dozen times per round. Makes me sad thinking how lost he is on the course when I’m not there. I would be giving this to my Father-In-Law, who is relatively new to golf, and terrible at judging distances! He’ll love it, and hopefully I can gift him the watch! He might just wear it everyday as a pedometer as well! To be honest I want to give it to the loving and dedicated father of my kids (which is me). Honestly this finder will most likely end up staying in my hands. All my golf buds have one and if I gave it to my dad he would give it to me since he doesn’t golf. With that said I think this contest along with all others are very good and THP always does a good job. Thanks for allowing me and others the opportunity to enter your contests. I would give this to my dad because he introduced the game to me. He gave me my first Bushnell GPS watch and I would love to return the favor.